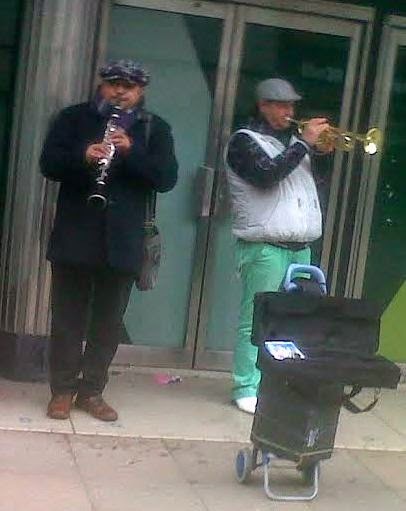 Russell, in an earlier post, referred to the diversity of buskers in Newcastle. Well today, South Shields saw three of those same street musicians peddling their wares on King St. They can play! A soprano saxman was blowing a plaintive lament by the fruit stall next to the Metro station. he got a good sound helped by the backing tape. He didn't seem to be drawing in the crowds which was a pity but, after all, this was South Shields and not the Southside of Chicago (except on a Saturday night after closing time). Further up King St. Clarinet and trumpet were In The Mood before boarding the Chattanooga Choo Choo. They were swinging. Clarinet doodling around the rich toned trumpet and both playing effective solos. This was Leonard and Florin. I happily donated 50p, took a photo, and went on my way. The afternoon's shopping done (London Pride in the Crossways Hotel) I returned to the Metro station where the three strolling players were divvying up before boarding the St James via The Coast Choo Choo. They sat opposite me but, as they were Romanian and spoke little English and I was English who spoke no Romanian at all, conversation was limited. "No money playing jazz in Romania"